The IAM is joining a coalition of nearly 600 organizations in demanding robust Congressional and public oversight over negotiations for the Trans-Pacific Partnership (TPP), a massive free trade deal that threatens workers’ rights, the environment, food and product safety, internet freedom, patent rights and more. Trade negotiators and corporate leaders secretly negotiating the 12-country pact want to “fast track” its approval. Fast track authority would limit Congress to an up-or-down vote on the 29-chapter agreement within 90 days, ignoring normal review, amendment and debate procedures. 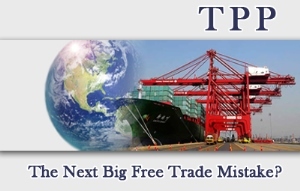 “The old Fast Track Trade Promotion Authority is simply not appropriate given the subject matter covered by today’s pacts,” writes the coalition in a letter to Senate Finance Chairman Ron Wyden (D-OR). The proposed new model would get Congress involved earlier, and more often, in trade negotiations. It would allow Congress to set criteria on appropriate U.S. trading partners based on human and labor rights compliance, mandate regular Congressional and public briefings on negotiating progress, and establish a way for a “sizeable minority” in either chamber to get a floor vote to withdraw expedited consideration of any trade deal. Tell Congress you want fair trade, not free trade, in the TPP<?u>.